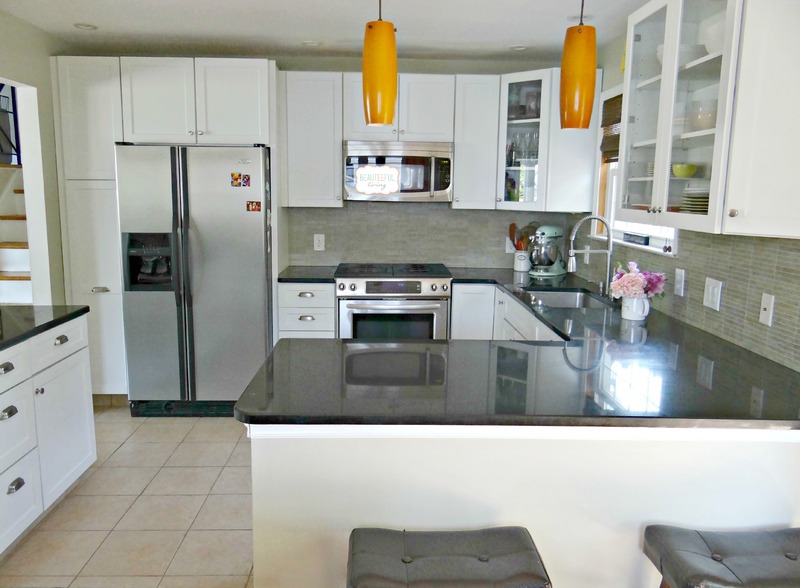 I’m so excited to share photos of how our kitchen looks today… 8 years since our kitchen renovation! You can see “before” pictures by clicking here in case you missed last week’s post. 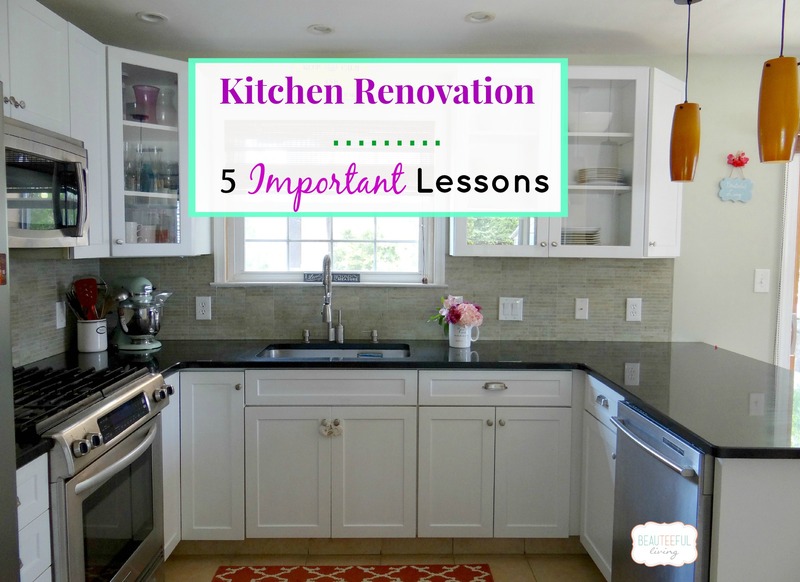 Along with showing how our kitchen looks, I’m also sharing “5 Important Lessons Learned from our Kitchen Renovation” in today’s post. From our living room, this is the view you will see first. The white cabinets definitely give the illusion that our kitchen is bigger than its actual size. 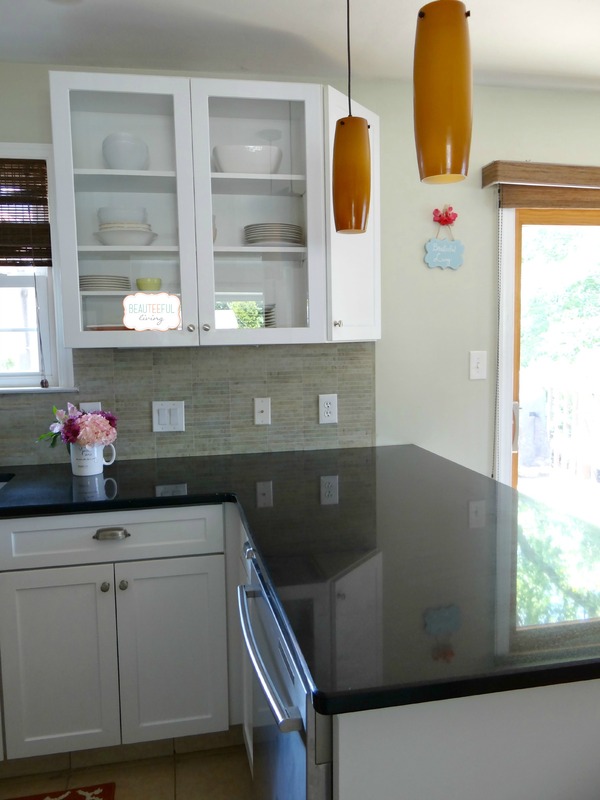 The black granite top gives a nice contrast to the light cabinets. As far as the backsplash goes, it is still one of my favorite elements in our kitchen. 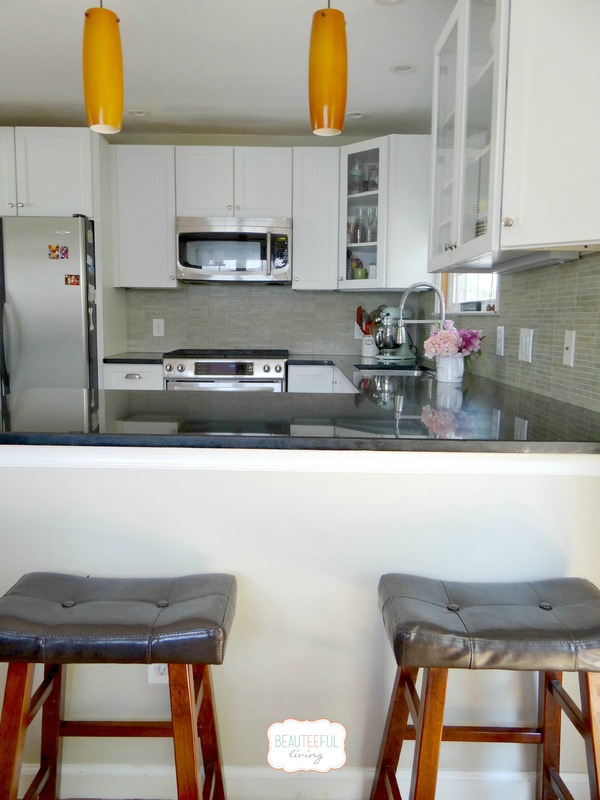 Since our kitchen is small, we could not have an “island” incorporated in our design. Instead, we settled on having a peninsula as our main “prep station.” It suits our needs perfectly! Notice how much light we get from the sliding doors in our dining room. We added these sliders during this kitchen renovation project. Our kids love sitting on the saddle bar stools pictured here (bottom of photo). This is where they eat quick meals. When the kids get older, I’ll be looking to replace these stools. I bought them for practical reasons (soft and cushion-y for young kids). My style would’ve been a little more modern. With these “window” cut-outs, our kitchen has an open view of our living room. I love how our bay window lets in so much natural light into our kitchen! Lesson 1 – Air should be vented “out” of house. While we love our kitchen, the biggest regret we have is not having the stove fan vent to the “outside.” With the type of cooking that we do, having our microwave circulate the air (without venting to the outside) is insufficient. One of these days, we’d like a kitchen exhaust fan installed to replace our over-the-range microwave. Lesson 2 – Dishwasher should be next to sink. Instead of having the dishwasher installed right by the sink, we chose to have our garbage and recycling bins located there. In hindsight, it’s much easier to have the dishwasher closer to the sink so you can load dishes easier. No need to worry about dripping plates after rinsing them and transferring to dishwasher. Lesson 3 – Put some thought into kitchen flooring. Not enough attention is given to flooring. Having done flooring for our 2 bathrooms after our kitchen renovation, I have to say that flooring is SO MUCH more important than I originally thought. We purchased the tan square ceramic tiles in our kitchen for practicality reasons. With grooves on the tiles, we thought they would be less slippery for us and our pets. We’re not thrilled with the way they look these days. I definitely foresee our kitchen floors being replaced in the near future. Nothing is worse than having to dig far back into cabinets in order to reach for a needed item. With all the available cabinet options available nowadays, you should definitely consider “pull out” cabinets for areas that are hard to reach like spots that are high (ex. above the refrigerator). You may still need a stepping stool but you wouldn’t have to pull items out in order to see what’s hidden in the back! 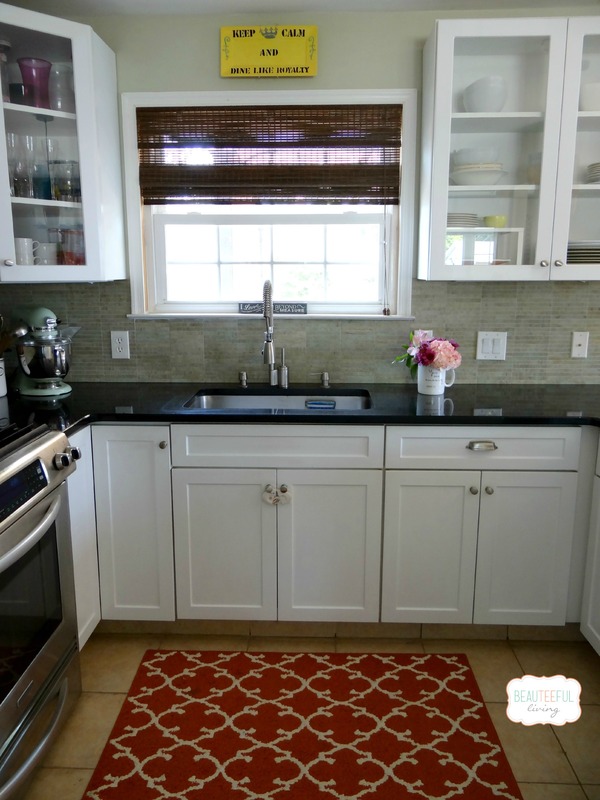 Lesson 5 – You can never have enough cabinets or pantry space. Even though on paper, it looks like you have way more cabinets than you’ll need, you will fill them all up in no time. Trust me on that. Do you have any idea how much space tupperware takes up? When in doubt, add another cabinet to your design plans (if you can). Found these tips helpful? Please bookmark this page or “Pin” this post for future reference. Is there anything in particular that you like most from the kitchen renovation we had done 8 years ago? Have a question or comment? As always, thanks for reading! XO, Tee. I am in love with your kitchen!! I’m in the process of buying a house and the kitchen will be the first to go. Can you give me a ideal if the cost and timeframe. Thanks! I love the keep calm sign. The kitchen looks so fresh and clean! Hi! I love your beautiful kitchen renovation! Great tips, too! I love it! 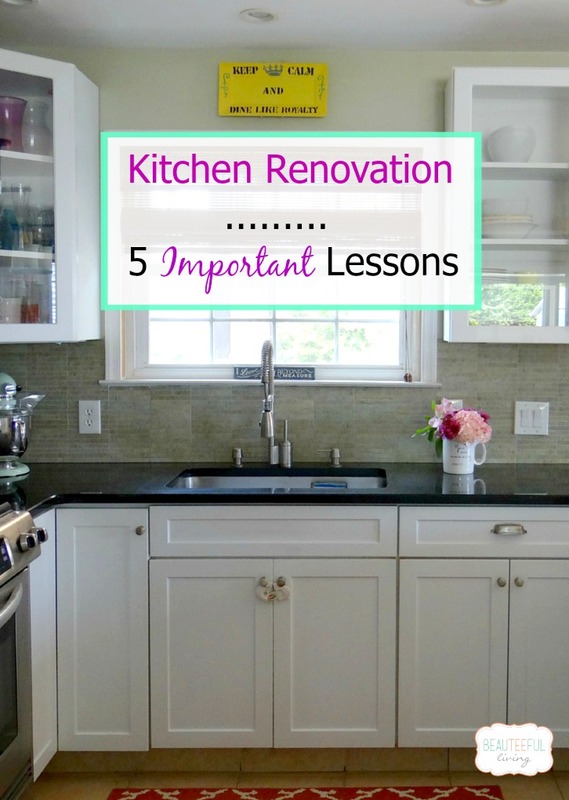 And I really wish I would have thought about lesson #4 before we redid our cabinets…it truly is a pain getting things out from the back of them! This is GORGEOUS! I love everything about this, especially your backsplash! You did a wonderful job on your kitchen!!! It’s beautiful and light. The first thing I did notice was the dishwasher. Live and learn, right?! 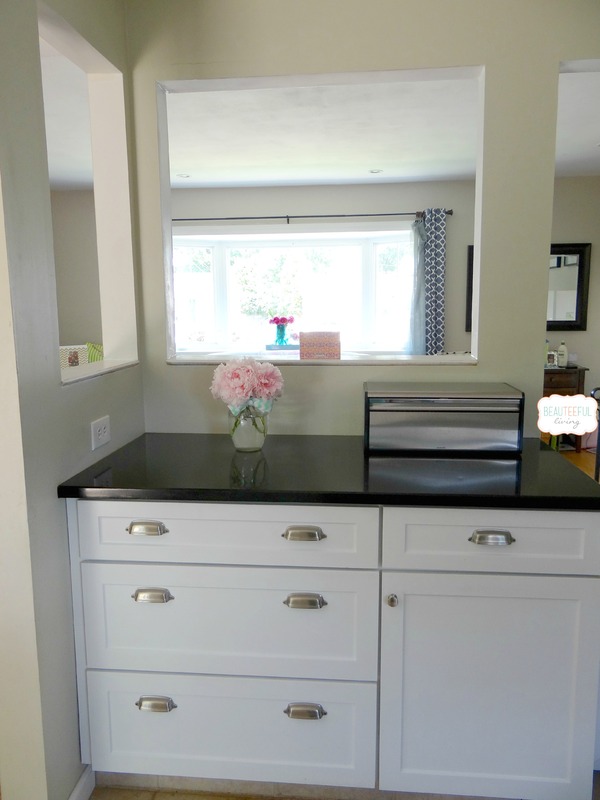 You have lots of prep space and I love that the kids can have a quick snack right there. Perfect! Great job. Your kitchen is so pretty. I think the back splash is my favorite part also but those drawer pulls and glass door cabinets are awesome. You did an amazing job. Beautiful renovation. 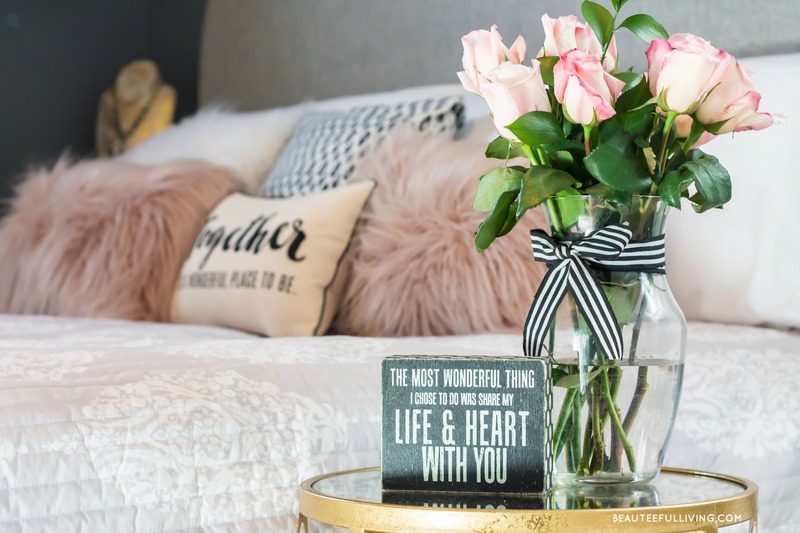 Everything looks light and airy. I never thought of putting down a rug in the kitchen but I may look into one for mine. The floor needs redoing and a rug would really work wonders at giving the space a lift before that happens. Thanks, Diana! Yes, feel free to break the rules of not having a rug in kitchen. Just use ones that have a rubber back and a material that can be thrown in the washing machine. They make them! :). A rug is the simplest way to mask a floor you’re not loving :). Thanks for commenting. Your kitchen is beautiful! I have a small kitchen too, and it is hard to use the space sometimes. Having it all function and be situated is key. We have a really awkward location of our dishwasher, you almost have to stand over it to use the sink when it is opened. Really annoying. I adore your white cabinets, with the glass. Also those drawer pulls are great! I love the white cabinets with the hardware! Great hardware! I love your pop of color with the lights too! Great job! Thanks, Ruthie! Those pulls from Restoration Hardware are the best. Really good quality. No issues 8 years later.